You know when you eat something and it’s just so good that it becomes legendary! You can tell stories about when you ate it and dream about the next time you will have it! Ok, may be I just love food a little bit too much! When we would travel as kids to Palm Springs with my parents, we would ALWAYS go to a restaurant called The Cedar Creek Inn and it didn’t matter how full we were, we would always order the Toll House Pie for dessert. Or we would go there just to pick up a few pieces to share…ya, right…at home. It was epic! 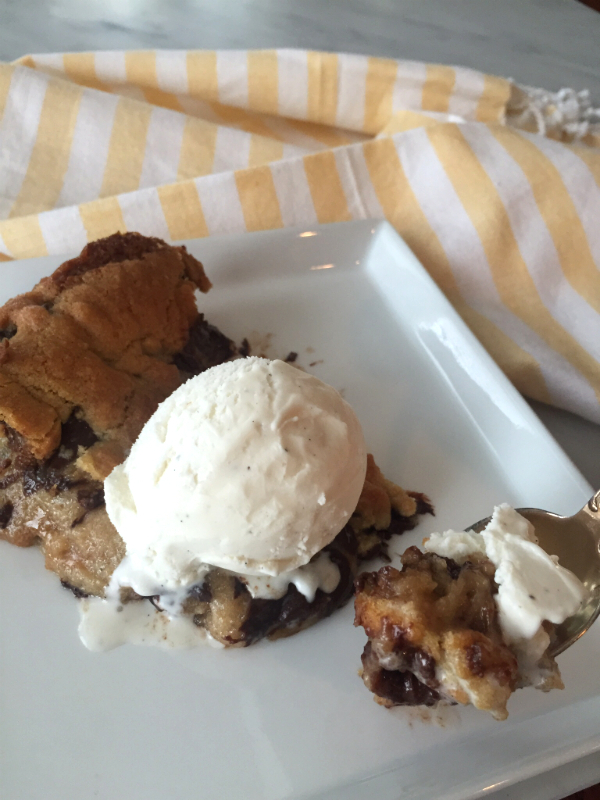 It was like a slice of a huge, warm chocolate chip cookie that was still a bit gooey and topped off with vanilla ice cream. Seriously one of the best desserts ever! Scott, Laurel, Jason and I just talked about it the other day. Sadly, The Cedar Creek Inn is no longer in Palm Springs, so this dessert is something we just reminisce about. I took up Scott’s challenge to recreate this treat, so off to Pinterest I went! 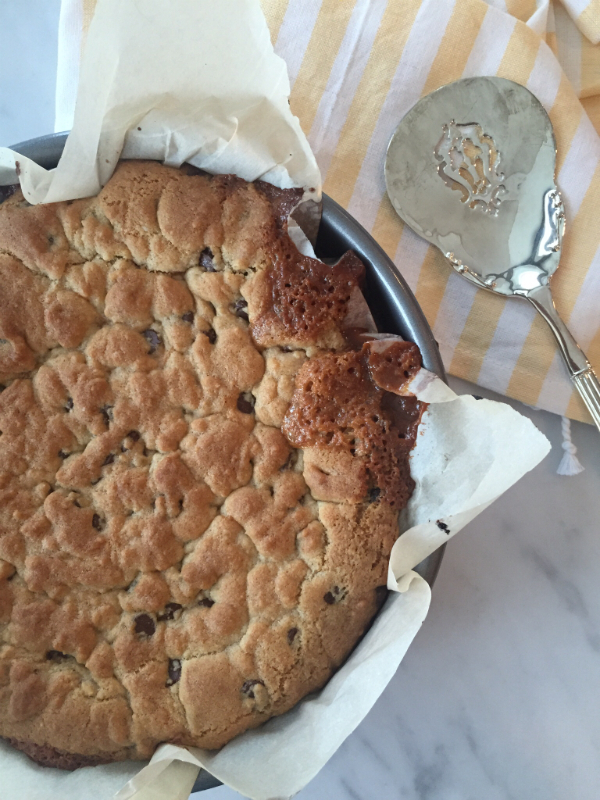 I found this recipe from Pinch of Yum, made a few tweaks to it (of course) and voila….Pam’s version of Toll House Cookie Pie! 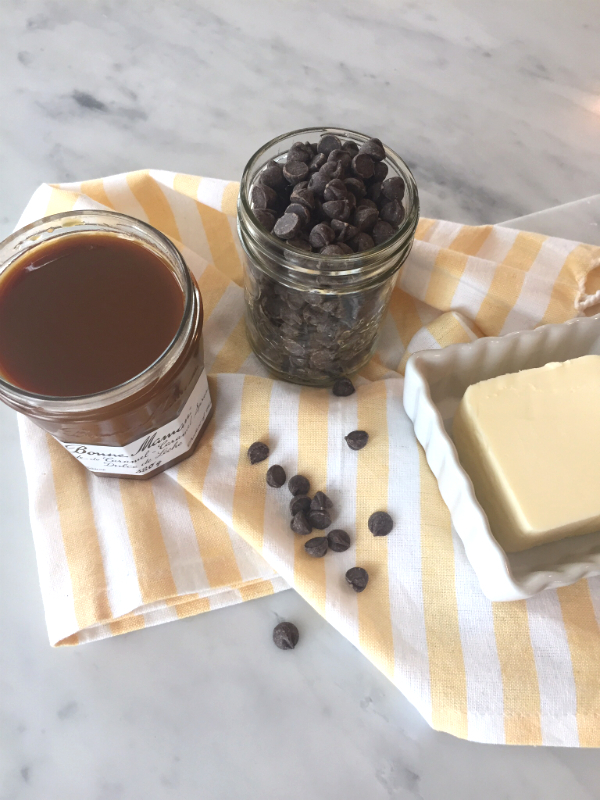 Three ingredients in particular make this so yummy…good quality chocolate chips, dulche de leche and real butter. Soften the butter in the microwave a bit (it should be slightly colder than room temperature). Mix the butter and sugar (white and brown) together with an electric mixer until creamed. Add the vanilla and maple syrup and blend until smooth. Add the eggs and beat slowly until well mixed in. Add the flour, baking soda, and salt. You may need to add the flour in batches. Mix until a smooth dough forms. The dough should be dry to the touch. If it's sticky, add a little more flour. 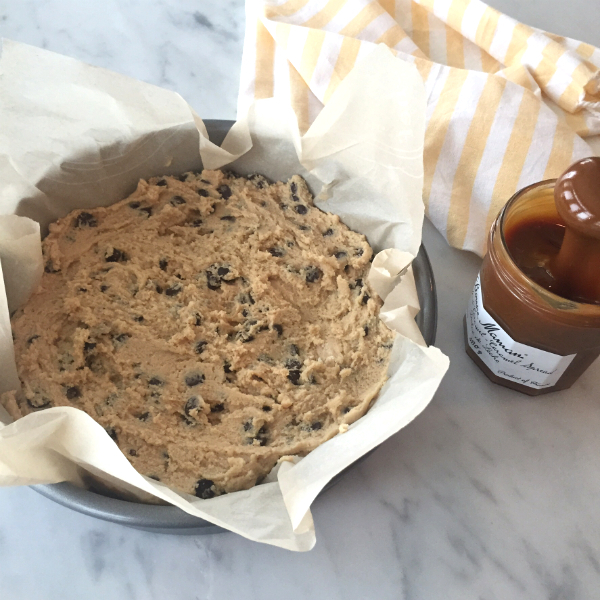 Press half the dough into a 9" cake pan lined with parchment paper. 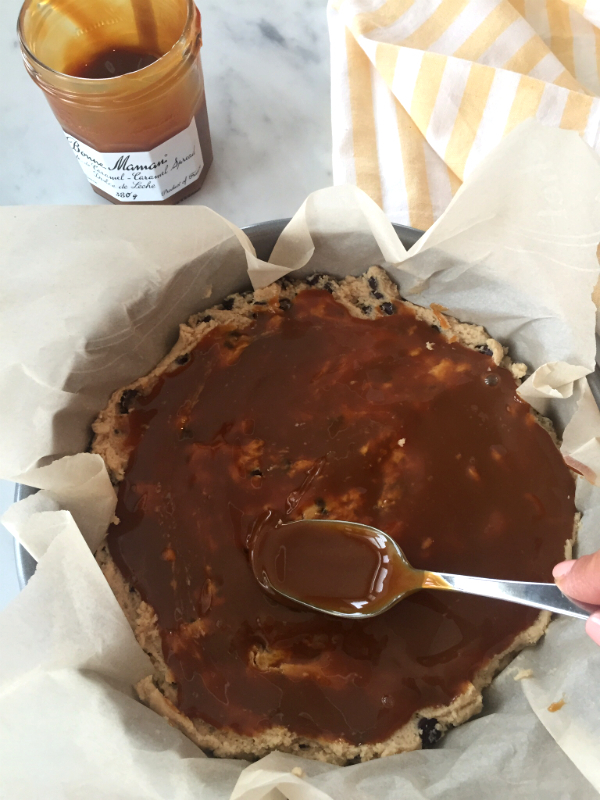 Pour the dulche de leche over it and spread it over the batter. Cover with the rest of the cookie dough. Bake for 15-25 minutes. If you like it gooey-er, bake it for 15 minutes. If you want it a little more cooked. Cover with foil about 15 minutes and bake an additional 10 minutes (that's what I did). Allow to rest about one hour so that it will hold it's shape when cut. Cut and serve with a scoop of vanilla ice cream. I had a bit of extra batter left that I baked up in small, greased, oven proof dish. I’ll cut it up and use it for lunches. You can make the batter in advance and prepare it in the pan and refrigerate it for a few hours until you are ready to bake it if you are serving guests. The house will smell amazing as it bakes!! Just don’t forget that it needs to sit about an hour before you serve it up. I love desserts you can make in advance to make entertaining easier. 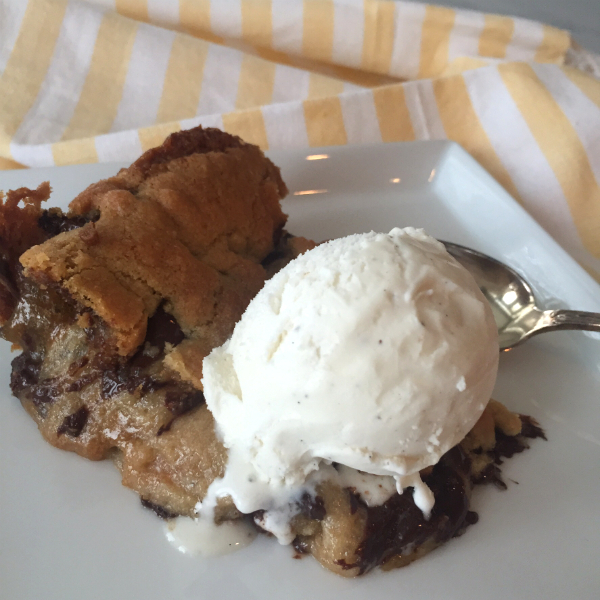 This dessert is kid friendly, but don’t kid yourself…pun intended…adults will go crazy over it too!